My research career began as an undergraduate in Dr. Stacey Smith’s lab at the University of Colorado Boulder. I learned so much from her and from everyone in her lab, especially Dr. Julienne Ng, who at the time was a postdoc in the lab. I spent a year working in her lab funded first through a BURST grant and then over the summer through an REU. After I graduated, I moved out to Michigan for the opportunity to work with Dr. David Lowry at Michigan State University. I am so grateful to everyone in that lab, and to the researchers from the College of Education with whom we collaborated. They helped me see more avenues for scientific outreach and they taught me so much about evolutionary genomics. I currently work with Dr. Scott Taylor at the University of Colorado Boulder, and have been tackling new projects with a brand new set of researchers—all of whom are amazing. I love the Colorado mountains, and I’m so happy to be home. I have been looking into genetic differentiation between species and subpopulations of Sulidae birds with a particular interest in genes underlying foot coloration, and will be performing whole genome analyses over the next few months. To date, I have spent most of my time reviewing the literature and exploring the stories of this system. I’m intrigued by the evolution of carotenoid coloration as an honest signal of condition in the blue-footed booby, and am interested in knowing more about the role of foot coloration in mate choice for booby species without a layer of structural collagen. I’m even more intrigued to know if boobies are capable of distinguishing smaller shifts in coloration in the green-blue range than in the red-yellow range, and in exploring the conversation between visual systems and mating displays. While I worked in David’s lab at MSU, we collaborated with education researchers associated with Create for STEM to create a curriculum that could be distributed to 7th grade classrooms around the country. I helped design the experiments for the curriculum, based on David’s past work on the genetic mechanisms of adaptive divergence in Mimulus guttatus, and wrote short stories that would ground those experiments in human experience. I intended to create stories that the students would relate to, so that they could see themselves as scientists, and to tell the stories in a way that encouraged the students to integrate their scientific thoughts into their lives. The curriculum has been enacted in several middle schools in Flint and Detroit. This year, I was recontacted by David and the education researchers because they are interested in transforming the stories into an illustrated experience. I have been storyboarding and working with a visual artist to reshape this resource into a small graphic novel. I have been helping the Taylor Lab get a long term study of chickadees up off the ground. I built Potter Traps to catch chickadees, helped build nest boxes, and designed the logo, which we will be screenprinting onto the hundreds of next boxes that will go up in the Boulder area and at CU’s Mountain Research Station. I have been learning to mist net and band birds, to sight bands, and to make field observations. Find out more at the website below (we’ll be updating it soon, and it likely won’t have much regarding the study until the end of Fall term). Phaseolus vulgaris. I assisted the postdoctoral researcher Dr. Ali Soltani in the setup and maintenance of a study of the common bean, which aimed to use QTL analysis to identify regions of the genome related to heat tolerance. We grew about 2000 individuals of around 300 varieties and collected data on the seed and pod output of each variety when exposed to heat. Panicum virgatum. The Lowry Lab monitors a common garden plot of reciprocal outbred F2 populations and their outbred grandparents. Clonal replications of these individuals have been plotted in similar common garden plots across a latitudinal gradient up the Great Plains. This ongoing experiment aims to use QTL mapping to identify regions of the switchgrass genome of interest to the production of biofuels. I collected data on rust infection rates throughout the summer, on floral phenologies, change in height, and percent of lodgings. I also collected, scanned, and sent off infected leaves for analyses of present pathogens. 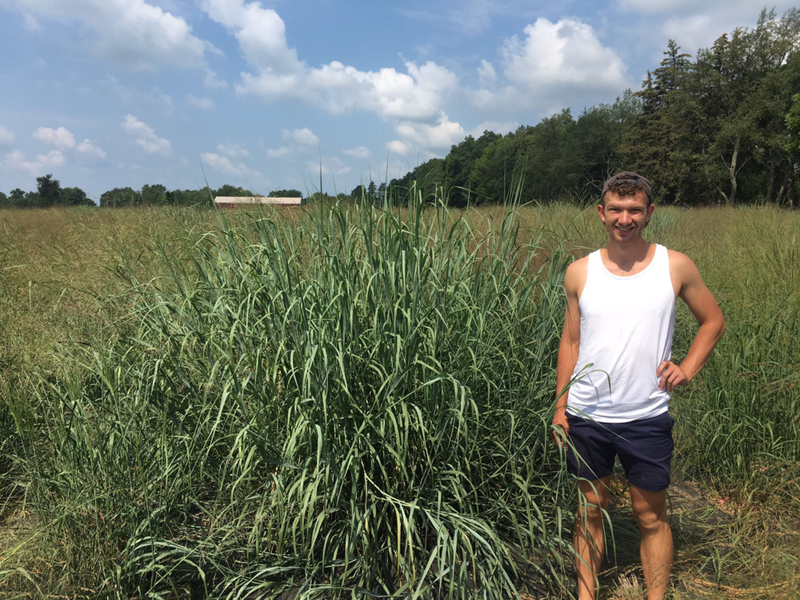 I grew up additional switchgrass individuals from seed and clonally divided them, which have been added to our site and to others around the country. Mimulus tillingii. I assisted a PhD student, Caitlyn Byron, in her study of local adaptation in this species of monkeyflower. Her experiment sought to answer the question: Are populations across an elevation gradient differently locally adapted in terms of heat tolerance? Mimulus guttatus. I assisted a PhD student, Dr. Damian Popovic, and a postdoctoral researcher, Dr. Patrick Kearns, who was brought in as a microbiologist collaborator on a field experiment in Northern California. M. guttatus exists in two distinct ecotypes, and Damian sought to build on previous research into the different selective pressures that act on these ecotypes by performing a reciprocal transplant experiment while excluding herbivores at each site, and comparing productivity to transplants left vulnerable to herbivores. I spent the first few months in the lab troubleshooting PCRs and learning about phylogenetics. I was helping Julienne construct a megaphylogeny of the Solanaceae family that she could use to answer questions about the origins of red flower coloration in this clade. I spent the summer reviewing the literature on the genus Cestrum and learning about floral phenology. I then designed my own experiment comparing flowering times across Cestrum species and I developed a phylogeny using that PCR data for the genus Cestrum. Ng, J., and S. D. Smith. 2016. Widespread flower color convergence in Solanaceae via alternate biochemical pathways. New Phytologist 209: 407-417.